The best way to find out if you are in Ketosis is to use a urine test stick to check your ketone levels. One of the most common ones is the Ketostix from Bayer. Ketone tests have many different names such as reagent strips, ketone testing strips, lipolysis test strips and urine test sticks. In order to make it clear for you what the advantages of a ketostix is and where to get them for a good price we have put together this guideline. But we need to start with how the Ketostix from Bayer actually works and in order to explain that we need to look at what ketones are. The easy explanation is that ketones is a rest product when the body is using ketoacids as its main source of energy. This happens when you eat a very low amount of carbohydrates, like when on a keto diet or other low carb diets. The body then uses the ketoacids as its energy source and the leftovers from this process are ketones. 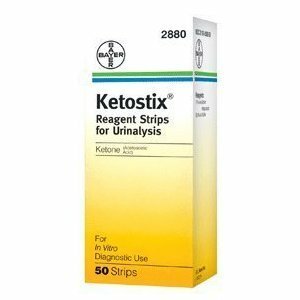 The body gets rid of the ketones through urine and that is how the ketostix from Bayer can measure the ketone levels. The main reason you should use a ketostix from Bayer is if you want to find out if you actually is in ketosis or not. This is important to know if you are just starting out with a low carb diet or if you have been doing it for a while and not really seen any results. By doing the tests with the ketostix from Bayer you can easily see if you are doing the right things or not. There are of course many other brands than the Ketostix from Bayer but this is the original and also still ranked as the best ones. I use them myself and would recommend them to you also. They cost around $25 for a 50 pack at a normal pharmacy or you can get a 50 pack or 100 pack much cheaper at Amazon . If you buy over a certain amount you will also get free shipping so there is no reason to spend additional money at the pharmacy compared to getting the Ketostix directly from Amazon.